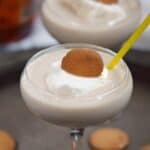 Sometimes you need a creamy, decadent Southern Banana Cream Cocktail for dessert, trust me!! Combine the liqueurs and ice cream in a blender. Pour into two glasses and top with a dollop of whipped cream, a vanilla wafer, and a straw. Serve immediately. I used Vanilla Bean CashewMilk Ice Cream which is why my cocktail is a taupe color instead of creamy white. Use a dairy-free whipped topping (Soy Whip, Rice Whip) for a dairy-free cocktail. I regret the choice of yellow straw. A black straw would have been much classier. Taste your cocktail before you pour it to make any adjustments. The nutritional analysis was calculated with regular vanilla ice cream. Your counts may vary depending on type of ice cream and whipped cream that you use.